This handsome dark-brown brick apartment building has a prime Upper East Side location and a very impressive, large, vaulted lobby. 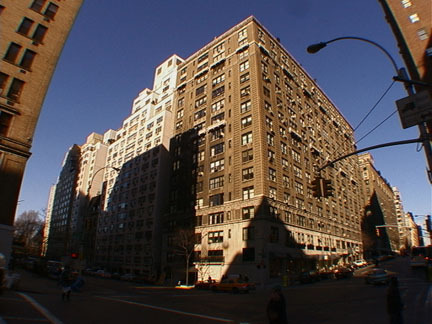 Erected in 1929, the building, which occupies the entire Madison Avenue frontage from 86th to 87th Streets, was converted to a cooperative in 1967. The 15-story building, which has a two-story limestone base at its entrance, has 103 large apartments. Its location just to the south of Carnegie Hill makes it convenient to many of the city's finest schools, numerous religious buildings, restaurants and boutiques. Although 86th Street is a major cross-town thoroughfare, only the westbound 86th Street buses pass by as the eastbound buses come out of Central Park at 84th Street and turn up and on Madison Avenue. Although 86th Street east of Park Avenue is very busy and full of retail activity, this section of the street is quite dignified and attractive. The Town Club, a private social club that was formerly the home of William Woodward, a banker, and a former Vanderbilt Georgian-Style mansion that has been converted to the Neue Gallerie as a museum for German Expressionist paintings are on the same block as this building. Central Park is at the eastern of the street and an express subway station is at 86th Street and Lexington Avenue where there is also a large Barnes & Noble bookstore, an HMV music store and movie theaters. This is one of the city's most desirable areas because of the many museums and attractive architectural ambiance. The building has nuce masonry, a doorman and a concierge, sidewalk landscaping and permits protruding air-conditioners. It has no garage and no health club.